Maui's wow-wee layout, the Plantation course at Kapalua Resort, is shutting down for repairs. The expected closing date is February 2019. Host venue for the PGA Tour's Sentry Tournament of Champions since 1999 and ranked No. 24 in GOLF Magazine's Top 100 Courses You Can Play, Plantation is a wildly undulating, 27-year-old creation from Bill Coore and Ben Crenshaw. Coore and Crenshaw will oversee the enhancement project, in conjunction with Troon's (the management company) design and agronomy team. Maui resident and long-time broadcaster Mark Rolfing will also assist. Among the refinements will be resurfacing every green with Tif Eagle Bermuda, renovating every bunker, re-grassing tees, fairways and roughs with Celebration Bermuda turf and adding several new tournament tees and forward tees. Several bunkers will be relocated as well. "It's time — time for a rejuvenation," Coore told GOLF.com. "Architecturally speaking, the changes are truly minimal. But like everything, golf courses are living, breathing creatures, and they evolve. They need polishing after awhile. That's what we're going to do here." From a design standpoint, Coore is "most fascinated" by the addition of a new tee box at the par-4 4th, close to the 3rd green. "We actually had it roughed in there from Day 1, but it was never put into use. Back in the days when many of the guys were hitting persimmon drivers, that tee was considered too demanding. Today, the guys are hitting it so far, well past the existing bunkers, that reviving that tee would be perfect. It's been sitting there all these years. We will just add some irrigation and cut back the native grasses." Coore is also enthusiastic about "restoring the visual character" of the bunkers that dot the layout (shapes and edges), as well as combining a teeing ground at holes 3 and 9. He's also pleased about adding approximately 10 forward tees to enhance playability for resort guests. However, what he touts as the "single biggest positive" of the refinement project is the re-grassing of the fairways and green collars. "We want to get the run back into the course. In the early days, we had conditions (at holes such as the 7th and 18th) where you needed to land the ball 30 to 40 yards short of the green. Conditions had become softer and softer over the years. Removing the thatch layer and re-grassing with Celebration will restore the ability to have the ground influence shots into the greens, just as it was in the beginning." 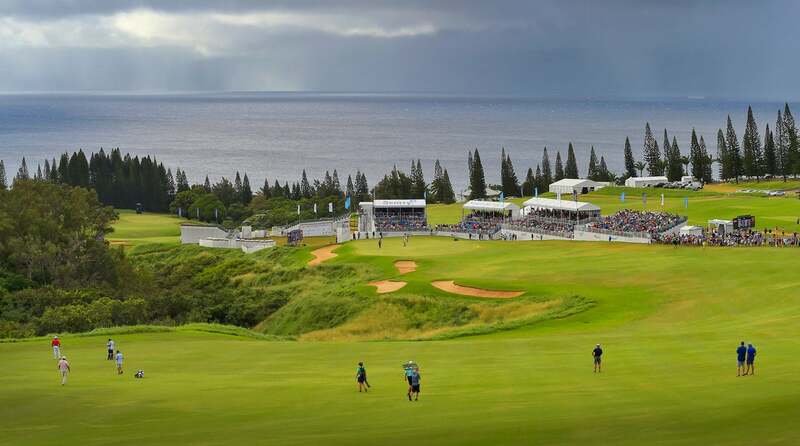 Kapalua's Plantation course is expected to re-open in November 2019.